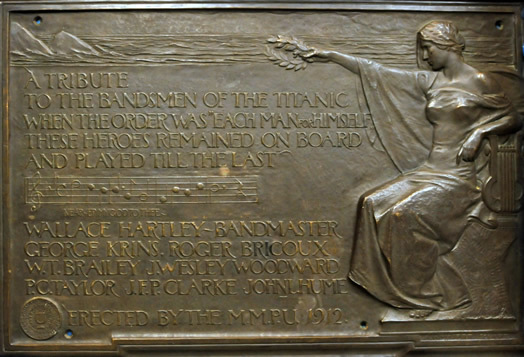 The Titanic musicians’ plaque says: “A tribute to the bandsmen of the Titanic. When the order was ‘each man for himself,’ these heroes remained on board and played till the last.” The plaque then lists the names of the Titanic musicians: bandleader Wallace Hartley, George Krins, Roger Bricoux, Theodore Brailey, John Wesley Woodward, Percy Cornelius Taylor, John Frederick Preston Clarke and John Law Hume. The plaque was commissioned by Local 802’s predecessor, the Musical Mutual Protective Union, after the Titanic sank on April 15, 1912. Photo by Walter Karling.